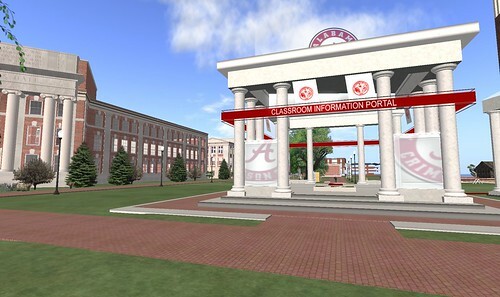 A Big Congratulations goes out to the following contributors to the University of Alabama’s Virtual Classroom Project. After two rounds of voting the following spreadsheet illustrates the breakdown down in winnings. As mentioned earlier, as not to present any conflict of interest, Keystone and Theory bowed out of the winning proceeds. We also have some exciting news to share! 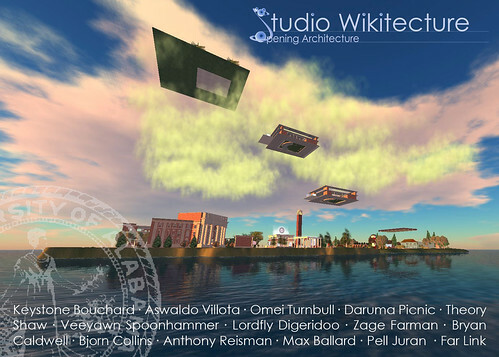 As many of you know, the ‘Wiki-Tree’ or 3D-Wiki tool we used during the last 2 Wikitecture projects was designed to serve as a temporary prototype, or proof-of-concept. It served its purpose well, and gave us a chance to test some ideas, observe what works, and what doesn’t work, and listen to the Wikitecture community’s concerns and ideas for improving this technology. We have spent the past several months carefully weighing several options for carrying this idea forward, and improving both the technology and the methodology at work behind the Wikitecture concept. We assembled a long list of improvements we want to make, and have consulted with some key players in the virtual world industry to solicit their input and advice about how best to achieve these goals. In the end, it was clear that our best chance of successfully improving these tools in the most time and cost-effective manner, was to formalize our partnership with i3D, the team we have been working with since the beginning. Toward that end, we have entered into a joint development agreement with them, and will be working together in the months ahead to develop ‘version 2’ of the Wiki-Tree. Not only have we have been working together on this project successfully for almost 2 years now, but each team brings a complimentary skill-set. Anyone who joined us in these projects knows how central the Wiki-tree is to organizing these collaborative design projects. Without it, the Wikitecture concept simply would not work. Since i3D is in the business of developing internet and virtual world based services and products, their skills are exactly what we need in order to successfully implement the next phase of development on the Wiki-tree. We will keep you posted on our progress in the weeks and months ahead, and look forward to launching our next project! Second Life is a ‘user-generated’ environment, and places that are built exclusively by professional content creators that do not engage the end-users in the creation process are often the most dull and lifeless places in all of SL – no matter how perfectly built or well designed they might be. Virtual campus spaces should engage as many individuals – faculty, students, community members – as possible – not just one person who goes off to build everything… that’s just as bad or worse than hiring a content developer to build everything for you. Architecture should be driven by the end-use, in an ongoing and constantly evolving design process that doesn’t have an arbitrary ‘end’. Virtual architecture doesn’t have to shape us…we can and should keep shaping it. People building virtual education spaces are building the foundation for their school’s future virtual endeavors, and have an opportunity to re-think what education means in a virtual environment – not just importing the way we do things in real life. Blocking diagrams, wayfinding, feedback, etc. groups, permissions, building teams, etc. Can students, faculty and community members design their own physical-world spaces in the future? 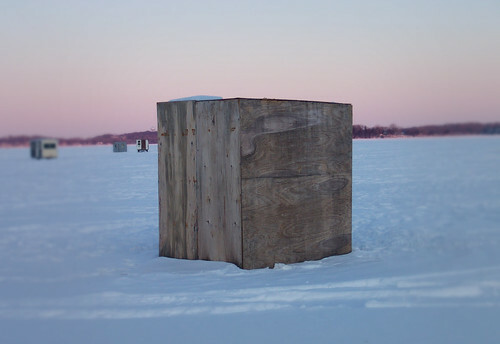 Can physical architecture be as dynamic and participatory as virtual architecture? Many thanks for Gianna Borgnine for moderating, and to everyone who helped organize this conference. Also, thanks to La Fundación Global Democracia y Desarrollo (FUNGLODE) for sponsoring this presentation. Don’t miss this! It is TONIGHT, Monday March 30th between 5pm and 8pm SLT. This project is sure to become a bar-raising effort for demonstrating the benefits of using virtual worlds in architectural education. I’m aware of at least 14 architecture schools from around the world that have actively engaged in virtual worlds, some top secret, some semi-public (usually only made public quietly, and only after the students are gone). So, what I find especially refreshing about the approach this group is taking is that not only are they designing out in the open, but they are actively seeking participation from the general public to participate and engage in their work. 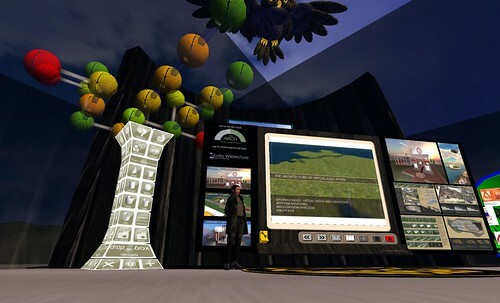 If on Monday March 30th between 5pm and 8pm SLT you are in-world it would be great to have you come and see what we are up to – the students from the University of Auckland in New Zealand are building in their living sketchbook. They will be in a building prototype frenzy and looking to have people play and talk about their ideas. Please come and run jump and fly through the thoughts of the first group of 9 students to venture into the Metaverse from the Architecture and Planning School. Because they are the first this event will be on the big screen with nine others computers infront of the whole school over the three hours- we would love to have the metaverse wave back to the physical world. Everywhere I turn these days, someone is reminding me that virtual worlds like Second Life or Opensim will never reach ‘mainstream’ adoption until everyday ordinary web users can access them through special plug-ins downloaded for those precious 2d web browsers we love so much. Lots of serious programmers are hot on the heels of this holy grail of technologies, but if you’re among those millions who are allegedly out there in the ‘mainstream’ who refuse to explore virtual worlds until you can see it through your browser, wait no more! I’ve created a special ‘Placebo Browser’ you can attach to your avatar, which provides the illusion that you’re still inside your browser! ** Just to reinforce the full effect, the browser is double-sided, so people you meet inside the virtual world will see you framed inside that beautiful browser as well! 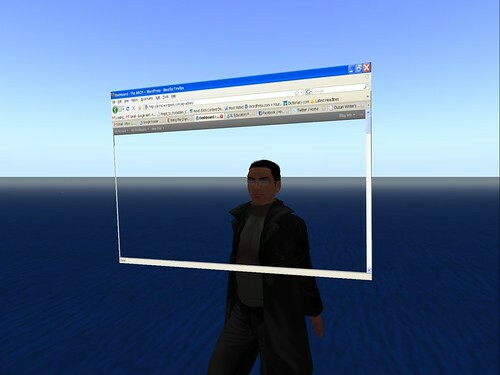 Send an IM request to Keystone Bouchard, and I’ll provide you with a free copy of the ‘Placebo Browser’ so you can finally begin to experience the metaverse from the safe, cozy and artificial comfort of a 2D web browser. ** Warning: Using a Placebo Browser can have serious side-effects such as others laughing at you, sometimes hysterically. Other side effects may include the obscuring of part of your screen, and the slight but potential risk that you may eventually want to remove the browser attachment in order to see the full virtual world experience full-screen. Be sure to check with your IT professional to be sure Placebo Browser is right for you. Seriously folks… we’re talking about a 22 +/- mb download (many 3D browser plug-ins and the subsequent content downloads are the same or far greater). This takes less than 40 seconds to download on average broadband. I realize browser integration is key for accessing virtual worlds behind a firewall (though I’m told many plug-ins are equally restricted), but is this the only way? While I’m at it, I also don’t think poor orientation or the presence of X-rated content is the big bottleneck either (there’s X-rated content and poor orientation in Manhattan, but people still do business there…). I think its those annoying bugs that haven’t changed in years and years. Its the lag, the gray goo, the forever-blurry textures that never seem to rez, the naked-avatar bugs, the lack of model interoperability, heck – even the name “Second Life” itself! Does it really have to be something ‘secondary’ or an alternative to my first life? I certainly don’t see it that way. One of the most exciting things about opensim is that I can simply tell people ‘I’m doing work in opensim’ and people are genuinely curious about what that is, and how it works. Compare that with the smirky, ‘you gotta be kidding me’ reaction I get when I tell people I work in Second Life. Yeah, maybe lack of browser integration is what’s keeping virtual worlds from the mainstream. Its certainly worth a try. Welcome to ARCHviews, a new podcast format where I take to the streets of the metaverse and talk with architects and designers exploring architecture of all forms – real or virtual. Today I talk to Kirsten Kiser, editor-in-chief of arcspace.com about her experience bringing her online publication into the metaverse. She celebrates her second year of virtual exploration this week, and has a lot of great insight to share. If the embedded video doesn’t show up, you can find it HERE. Enjoy! I had a professor in architecture school who taught a ‘Drawing in Architecture’ class, and talked a lot about the importance of sketching. The basis of his argument was that the process of sketching an architectural form results in the shortest possible conduit from what the eye sees, through the brain, into your hand, onto the paper and back. The argument follows that this connection is especially important while designing, given that your ideas can be transferred directly to paper without any abstraction impeding its flow. I’m sure this concept of hand/eye connection has been around for centuries, but it was an especially hot topic during my college years, which happened to land directly in the middle of the tension zone between hand-drafting and the newly emerging world of CAD. When I was a freshman at SARUP, there were maybe 6 macs in a makeshift lab, used mainly by urban planning students who got to play ‘Sim City’ as part of their curriculum (slackers! ;-)). By the time I graduated, there were three large dedicated computer labs with hundreds of computers (and 2 new plotters that only the PhD students could figure out how to use…). I remember some pretty rowdy debates around this time, where professors and students alike battled over the merits of CAD drafting versus hand-drawing. Here’s my point. The debate settled around a middle ground; CAD was acceptable for generating final presentations, and for drafting blueprints, but should never be used for design. The reason being, the interface was too much of an abstraction, and the hand/eye connection was too disjointed. You had to build in abstract 2D views, and then change viewports, create a camera, and take a look at how that idea turned out. CAD design resulted in an added barrier between your hand and your eye. For the most part, this hasn’t changed. Even in professional design software, and even if you’re an expert user, it really isn’t as free-flowing as sketching. Most architects I know still hand-sketch ideas first, then use computers for more refined design development, when dimensional accuracy becomes more important. Those models then carry on into illustrations and blueprints. A familiar and appropriate quote in this context, I think. The other element of sketching is the social side of it. A popular technique in architecture schools is to have students sketch ideas, then have everyone lay their sketchbooks open on a table in the center of the studio. Students then walk slowly around the table reviewing and critiquing each other’s sketches. As such, even programs like SketchUp that might enable a more ‘sketch-like’ modeling interface can’t really duplicate this social element of hand-drawn sketching. SketchUp is lonely. I was recently chatting with my friend JudyArx Scribe, who teaches architecture at the University of Auckland. She is just getting started with some very exciting new uses of Second Life in her curriculum, and part of the way she introduces Second Life to her students is by describing it as a ‘living sketchbook.’ As students are sketching ideas, they can all be immersed in the same virtual space and can easily see the progress of the entire class at a glance. They can wander around the emerging prim-sketches, providing their feedback, and soliciting input from others. Instead of walking desk to desk looking over the shoulder of students busily sketching on trace or in sketchbooks, the entire class is all working together inside the same place. Not only can the course instructor see everyone’s progress developing in realtime, but in theory, any professor or visiting critic from anywhere in the world could log in at any time to review their progress. Then there are prims. I used to sketch everything with pen or pencil and paper, but I now find myself logging into Second Life or my new Visibuild sim when I’m trying to translate a design idea from my imagination into ‘reality’.. (you might say it isn’t real, but is a sketch any more real?) I know there are some who would claim they can just as easily sketch in 3DS or CAD, but if you watch that process, and watch how they work, you will see that the extra step between your brain and the 3D ‘sketch’ remains evident. Look up any YouTube tutorial and see the process experts use to model in any of these apps, and you’ll see what I mean. Primitive modeling keeps you in 3D throughout the design process, showing the results of your actions in realtime as you draw. There is no more of a disconnect between holding a button down on my mouse and stretching a prim than there is holding my pencil to a paper and dragging it across the surface. But there is added value with prims. I can much more easily test textures and colors, and copy an idea to test a new direction – similar to using layers of trace paper, but without having to re-draw everything each time you trace. That’s just the beginning. I also place a lot of credence in the benefits of using avatars. Walking through a space with an avatar gets so much closer to the way we actually experience architecture in real life. There is a kind of spontaneity and magic to the experience that static illustration just can’t replicate. It has always seemed strange to me when architects describe how they think people will flow through their buildings, and how they believe the space will be experienced. They employ all manner of flowery and descriptive language, but why not actually let people walk through the space, and test how well that carefully crafted architectural choreography of yours will actually work? Nothing can beat the experience of guiding a group of brutally honest avatars through a design idea you just built, and hearing what they think. You might even test new ideas on the fly. This wall is too tall? Let me shorten it.. there, much better. This space is too big? Let me make it smaller.. nope too small… ok how about now. Perfect. This is simply a better way to learn architecture, and test ideas than any other method available. We all know how important it is for architects and professional designers to be able to import their professionally-built models, and I’m sincerely glad realxtend and Visibuild have taken that bull by the horns. But there is still something incredibly rich and important about modeling with primitive objects that I hope we never lose. Of course, I’ll never stop sketching by hand, but its more recreational now, and much more about the nostalgia of the technique than anything else. If I’m serious about designing something, and sharing it with others, I would sooner rez a prim than pick up a pencil. The benefits outweigh the limitations 10 to 1.